Supernumerary teeth are considered to be one of the most significant dental anomalies affecting the primary and early mixed dentition and may cause a variety of pathological disturbances to the developing permanent dentition and also resulting in poor dental and facial esthetics. Mesiodens is the erupted or unerupted extra tooth in the midline of the maxilla, along with normal teeth (between the central incisors). Early diagnosis and prompt treatment are necessary for the prevention of deleterious effects on dentoalveolar structures. The inverted conical mesiodens is frequently associated with cystic lesions and can erupt into the nasal floor, becoming more difficult to remove with time. 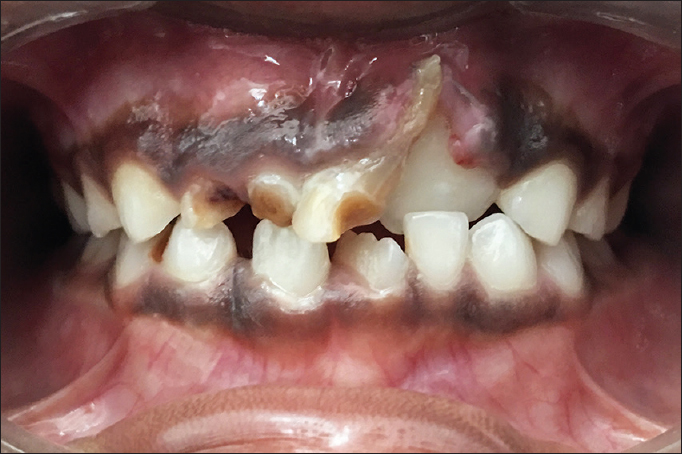 The aim of this case report is to share knowledge about the management of bilateral impacted mesiodentes including the inverted type cases with unusual location, which might assist the clinician in decision-making. Supernumerary teeth in the maxillary anterior region may also compromise facial esthetics. The most common supernumerary teeth with its most common site is seen in the palatal midline between the maxillary central incisors are termed as mesiodens, which accounts around 80% of all supernumerary teeth. Based on their morphology, mesiodens shape may be conical, tuberculate, odontome, or may closely resemble to the normal tooth series. Mesiodens can occur individually or as multiples called as mesiodentes. The etiology of these teeth is still obscure, although several theories have been suggested such as genetics, dichotomy of the tooth bud, hyperactivity of the dental lamina, combination of genetic and environmental factors, proliferation of odontogenic cell rests, palatal offshoot from continued activity of the dental lamina after the normal number of tooth buds are formed, and atavism.,,, Genetics and consanguineous marriages are also considered as etiological factors. A mesiodens may erupt normally, stay impacted, appear inverted, or take a horizontal position series. When they are inverted, the chances of eruption into the oral cavity are very less. The frequency of inverted mesiodens constitutes approximately 9%–67% of all reported cases., Mesiodens may give rise to a variety of complications such as impaction, delayed eruption, ectopic eruption of adjacent teeth, crowding, malalignment of incisors, midline diastema, displacement and axial rotation of adjacent teeth, dilacerations, radicular resorption of adjacent teeth, possible development of dentigerous cyst and migration into nasal cavity or maxillary sinus, and fistula between oral and nasal cavity series.,, This case report describes an extremely rare occurrence of bilaterally impacted mesiodentes with an inverted mesiodent in the hard palate area with its associated anomalies. It also describes about the early diagnosis with treatment planning. A 7-year-old male patient came with a chief complaint of his unesthetic malaligned anterior teeth. There was no associated history of trauma and pain. Medical and family history was noncontributory. There were no signs of any syndrome. On intraoral examination, it was observed that 21 was erupted whereas 51 and 61 were retained with unerupted 11 giving an unesthetic appearance [Figure 1]. Intraoral periapical (IOPA) radiograph showed the presence of unerupted mesiodentes of conical shape with an inverted one located parallel to 11, while the other one was erupting normaly and was parallel to 21 [Figure 2]. Blood investigations were done, and the reports were well within normal limits. 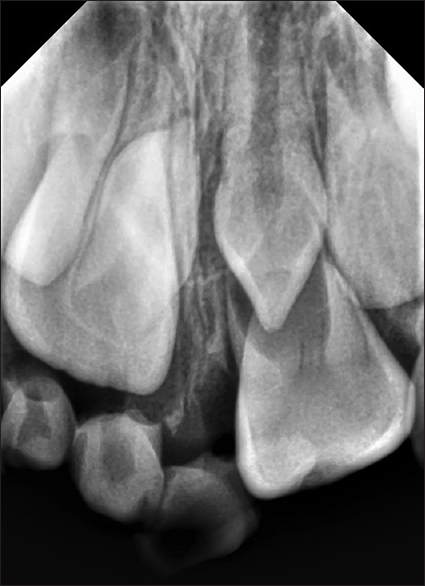 Figure 1: Intraoral photograph showing unerupted 11 with retained primary incisors and erupted 21. Figure 2: Radiovisiography showing retained incisors 51, 61 and bilateral mesiodentes with an inverted one with respect to tooth 11. 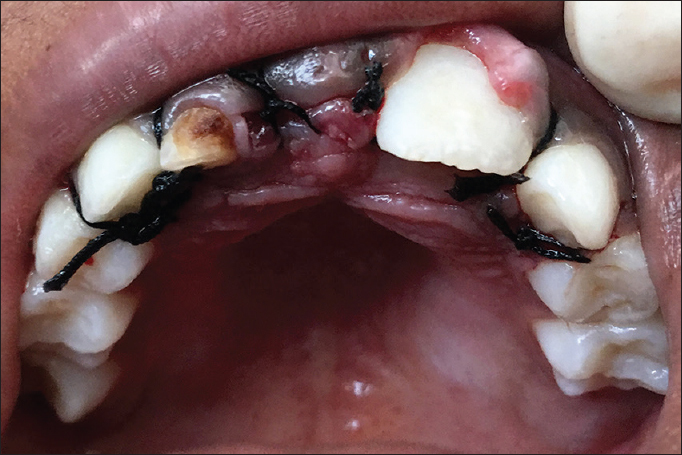 Treatment was planned to remove the retained deciduous incisors and unerupted mesiodentes after the surgical exposure of full-thickness palatal flap was raised from the right first primary molar to the left first primary molar [Figure 3]. On flap reflection, mesiodentes were noticed and were removed after minimum bone removal [Figure 4]. The palatal flap was placed back, and interrupted sutures were placed [Figure 5]. 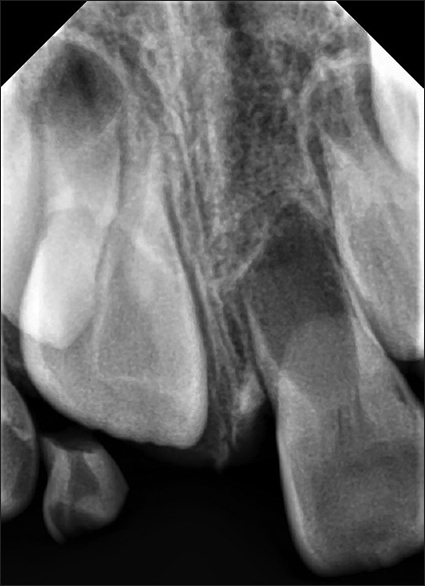 Later, IOPA radiograph was taken to confirm the extracted mesiodentes and retained incisors [Figure 6] and [Figure 7]. Following the removal of sutures 1 week later, the patient was scheduled for monthly recalls. The wound healing was uneventful, and the patient presented with no postoperative complications. Figure 3: Intraoral photograph showing meiodentes after palatal flap reflection. Figure 4: Intraoral photograph showing sockets after mesiodentes extraction. Figure 5: Intraoral photograph showing sutured surgical site. Figure 6: Radiovisiography showing extracted mesiodentes and retained 51 and 61. Figure 7: Photograph of extracted mesiodentes and retained 51, 61. The term of mesiodens is used to refer to an unerupted supernumerary tooth in the midline of maxilla between the central incisors. Mesiodens is defined as an extra tooth along with normal teeth with the prevalence of 0.15%–1.9%. One mesiodens occurred in 78.1% of the cases and two in 21.9% of the cases. Most of the mesiodentes (55.2%) were found to be in a vertical position (55.2%) followed by inverted position (37.6%) and horizontal position (7%). Most of the mesiodens remain unerupted, and if they are erupting, it will be an ectopic eruption., The inverted and transversely aligned mesiodens never erupt into the oral cavity. The maximum incidence of mesiodens reported between 7 and 9 years of age. This observation may be due to the fact that maxillary permanent central incisors erupt at this age. Radiological examination of noneruption or axial rotation of the upper central incisors or diastema might reveal the presence of mesiodens. The treatment of impacted mesiodens centers on several factors which include the age of the child, clinical manifestation, capacity of the child to tolerate the surgical procedure, and root development stage of the adjacent permanent teeth. 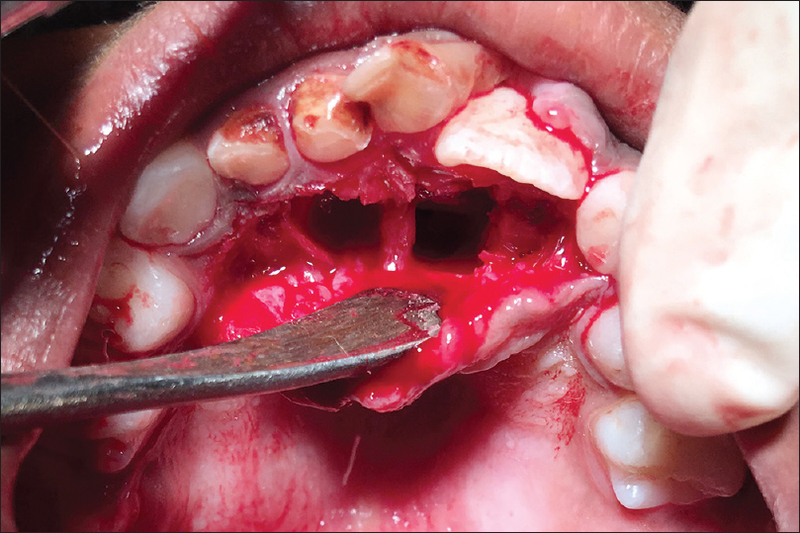 The case presented herein was considered to be extremely rare, as the bilaterally placed two mesiodentes were seen in a single patient with an inverted one has also been reported rarely. However, in this present case, the left upper central incisor had already erupted into the oral cavity while the eruption of the upper central incisor is been hindered by the retained primary incisors. Furthermore, the inverted impacted mesiodens presents in relation to 11 will never erupt, and it hinders the eruption of 11. The normally erupting impacted mesiodens in the right side is causing the initial radicular resorption in the right maxillary central incisor. Due to these ongoing and future complications, the impacted mesiodens were indicated for extraction. Nevertheless, the extraction that has been done at the right time, in this case, can prevent the future migration of the supernumerary teeth and its further complications. Fortunately, the postsurgical phase was uneventful in this surgical intervention. On surgical removal of impacted supernumerary teeth in the maxillary anterior region, there are no much complications or disturbances to adjacent teeth with incomplete root development were reported compared to the postponement of surgery until incisors root development is completed. During the surgical removal of impacted supernumerary teeth in the maxillary anterior region, complications or disturbances to adjacent teeth with incomplete root development compared to the surgery postponed for complete root development of incisors has not been reported. The spontaneous eruption of impacted maxillary incisors after removal of the supernumerary teeth depends on the several factors such as the depth of the impacted tooth, amount of root development, the angulation of the impacted tooth, and the available space required for its eruption. Therefore, immediate orthodontic extrusive traction results in eruption of the impacted incisors following the surgical removal of the supernumerary teeth. Thus, avoid the need for the second surgery. Moreover, it has been suggested that early exposure and bonding the unerupted incisor may result in loss of supporting bone and create scar tissue, which may further delay its eruption. Mukhopadhyay S. Mesiodens: A clinical and radiographic study in children. J Indian Soc Pedod Prev Dent 2011;29:34-8. Sarne O, Shapira Y, Blumer S, Finkelstein T, Schonberger S, Bechor N, et al. Supernumerary teeth in the maxillary anterior region: The dilemma of early versus late surgical intervention. J Clin Pediatr Dent 2018;42:55-61. Viswanathan R, Pai S. Bilateral impacted inverted mesiodentes in the palatal vault: A rare case report. Ped Dent J 2015;25:26-8. Nagaveni NB, Umashankara KV, Sreedevi, Reddy BP, Radhika NB, Satisha TS, et al. Multi-lobed mesiodens with a palatal talon cusp: A rare case report. Braz Dent J 2010;21:375-8. Jindal R, Sharma S, Gupta K. Clinical and surgical considerations for impacted mesiodens in young children: An update. Indian J Oral Sci 2012;3:94-8. Desai VD, Baghla P, Sharma R, Gaurav I. Inverted impacted mesiodents: A case series. J Adv Med Dent Scie 2014;2:135-40. Canoglu E, Er N, Cehreli ZC. Double inverted mesiodentes: Report of an unusual case. Eur J Dent 2009;3:219-23. Hasan S, Ahmed SA, Reddy LB. 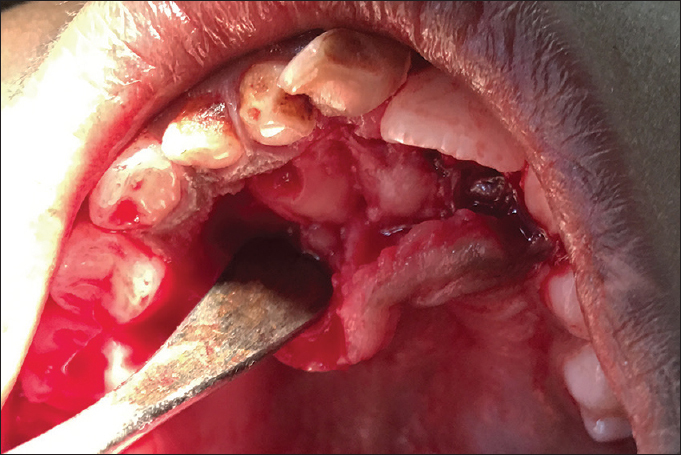 Dentigerous cyst in association with impacted inverted mesiodens: Report of a rare case with a brief review of literature. Int J Appl Basic Med Res 2014;4:S61-4. Omer RS, Anthonappa RP, King NM. Determination of the optimum time for surgical removal of unerupted anterior supernumerary teeth. Pediatr Dent 2010;32:14-20. Rajab LD, Hamdan MA. Supernumerary teeth: Review of the literature and a survey of 152 cases. Int J Paediatr Dent 2002;12:244-54. Garvey MT, Barry HJ, Blake M. Supernumerary teeth – An overview of classification, diagnosis and management. J Can Dent Assoc 1999;65:612-6. Gupta S, Marwah N. Impacted supernumerary teeth-early or delayed intervention: Decision making dilemma? Int J Clin Pediatr Dent 2012;5:226-30. Olson JW, Miller RL, Kushner GM, Vest TM. Odontogenic carcinoma occurring in a dentigerous cyst: Case report and clinical management. J Periodontol 2000;71:1365-70. Hyun HK, Lee SJ, Lee SH, Hahn SH, Kim JW. Clinical characteristics and complications associated with mesiodentes. J Oral Maxillofac Surg 2009;67:2639-43. 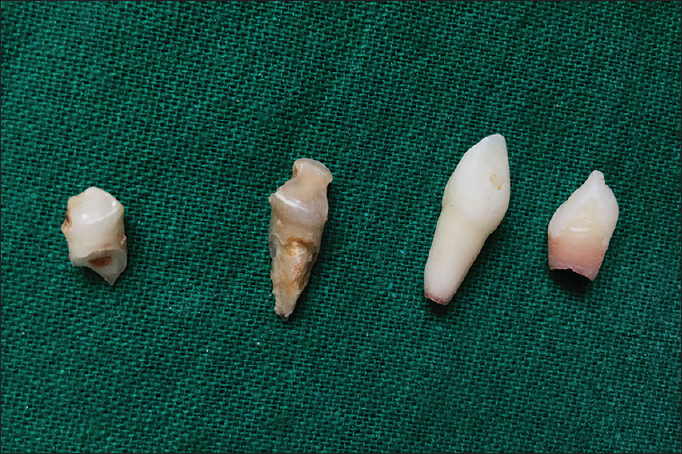 Ashkenazi M, Greenberg BP, Chodik G, Rakocz M. Postoperative prognosis of unerupted teeth after removal of supernumerary teeth or odontomas. Am J Orthod Dentofacial Orthop 2007;131:614-9.